Puppy formula is made with high-protein chicken as the first ingredient plus wholesome peas, pumpkin and apples. Supports a strong immune system and healthy bone growth with 20 superfoods like cranberries, blueberries, beets, watercress, almond oil, kelp, and more. 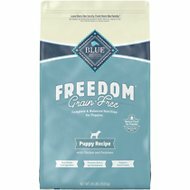 Contains all the vitamins and minerals fast-growing puppies need, plus non-synthetic DHA and EPA omega-3 fatty acids essential for growth. Formula is easy on your puppy’s digestive system, and is great for weaning puppies of all sizes and breeds. Made in the USA with highly-digestible ingredients and zero fillers, corn, wheat, soy, grain, gluten, carrageenan, or artificial preservatives. My three month old puppy Was on puppy chow when I got him at eight weeks old. And out of nowhere he started having stomach problems and once I switch to a solid gold puppy food within four days all his stomach problems were gone. 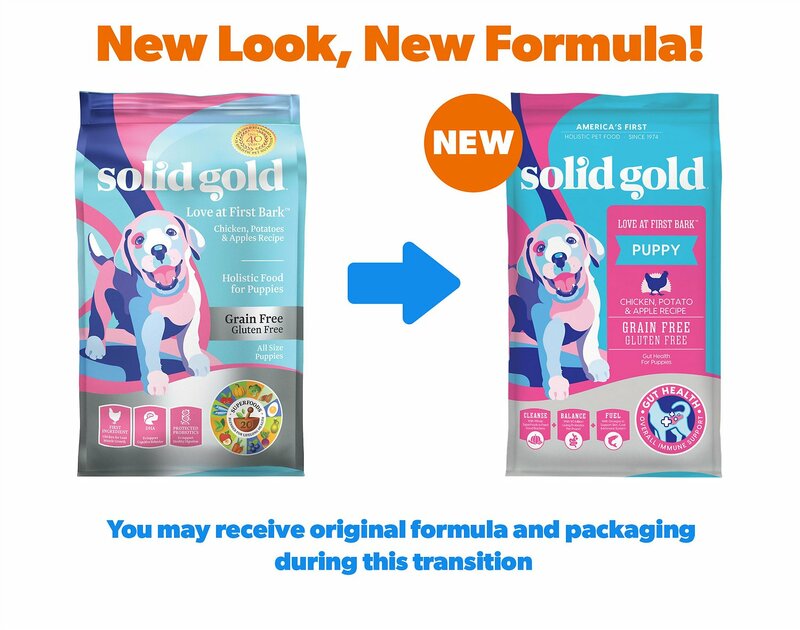 We buy Solid Gold Weight Management Dog Food also. Love feeding them food that they like AND that's good for them. Very easy to see in their shiny coats & bright eyes. 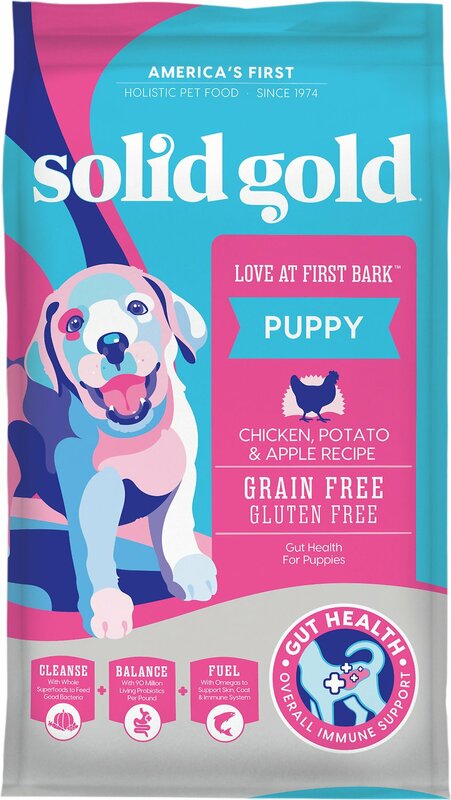 We've been feeding Solid Gold Puppy Recipe to our Pit Bull puppy since we got her at 8 weeks old. We're a little picky about what we feed her and Solid Gold has been great and she loves it! Solid Gold is a good quality food! First Bark Chicken is great! Our puppy was a bit sensitive with another food and we changed and all problems solved! My puppy gobbled this up! He didn’t even have the loose stools that doctors warned me about, for not knowing what he was fed b4 he came home to me. As a matter of fact, my grown dogs can’t keep their noses out of the lil guys bowl either. A wonderful source of nutrients... compared to other brands- in my opinion, this is the BEST! 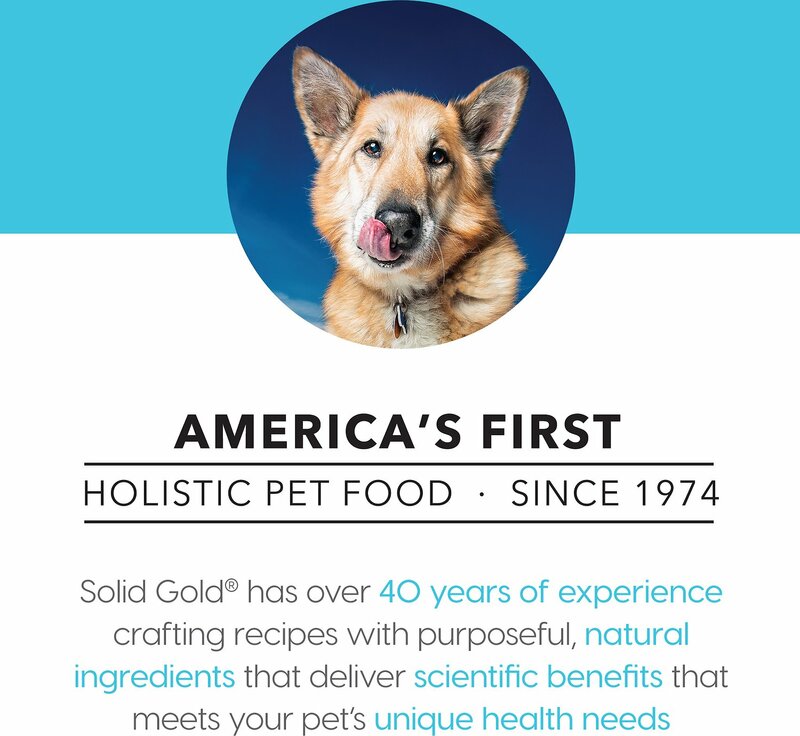 I have been happy with Solid Gold Dog Food for over 20 years. My Australian Shepherd Breeder suggested this company years ago and I recommend to all my friends that are seriously interested in good health for their four legged friends. 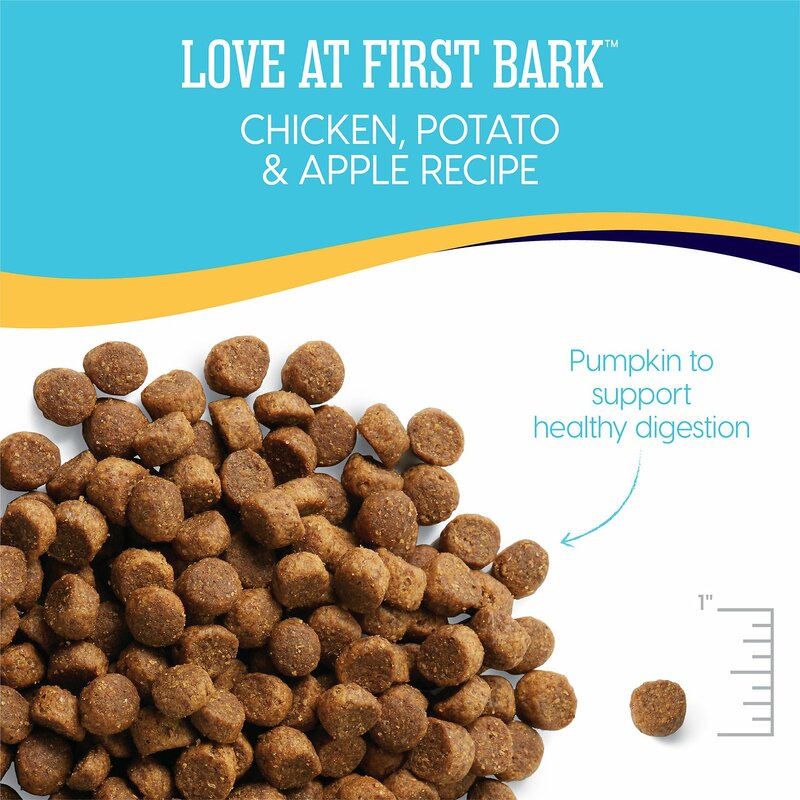 My puppy took some time warming up to this kibble and she never eats very much of it, its been giving her a gurgly stomach so I don't think she is digesting it well. On to try a different brand. 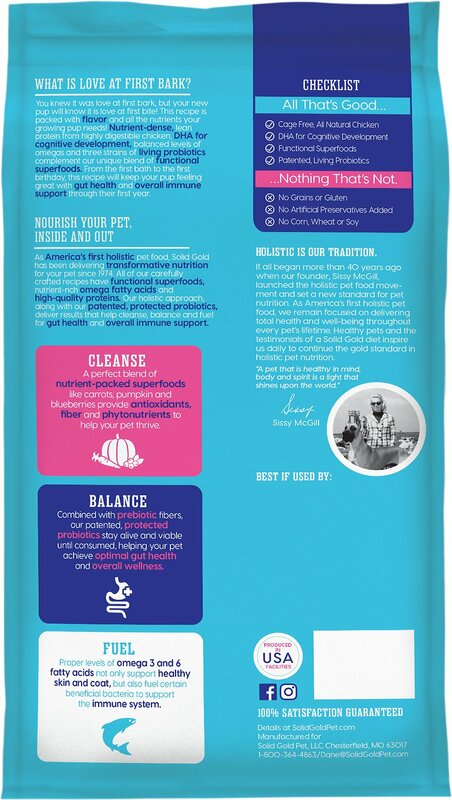 Puppy Food with Healthy ingredients. Puppy food we bought couple of different flavors with Solid Gold. This flavor he choice wasnt crazy about it dry but add tablespoon of wet food mix together. He loved it! My 13 week old black lab puppy cannot eat this food fast enough. 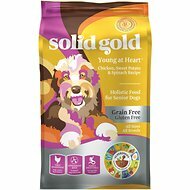 I have been feeding my yellow lab and Golden Retriever Solid Gold food since they were puppies and they are as healthy and happy as I could hope for. I am doing the same for my new baby and I could not be happier that she loves this food.